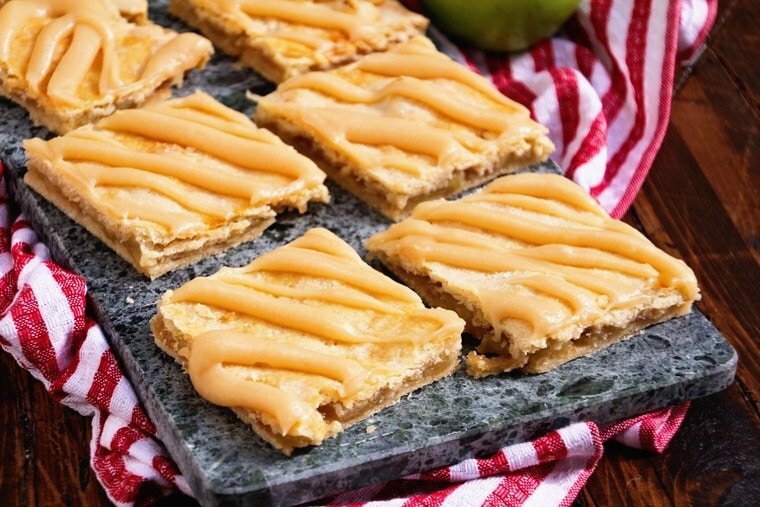 This Apple Bar Recipe is the perfect fall dessert! 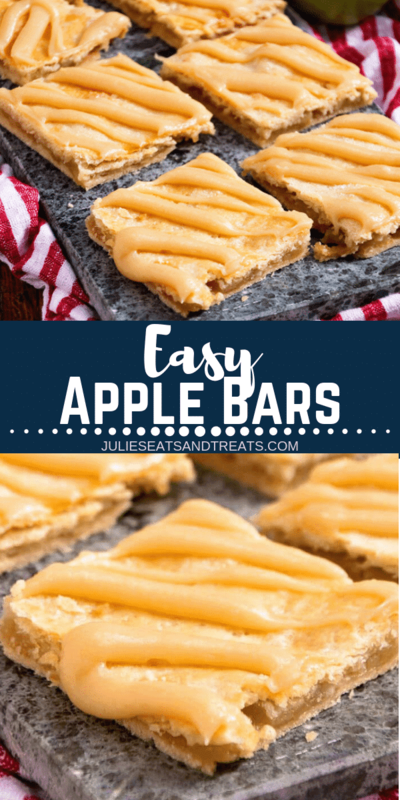 These Apple Bars topped with a Caramel Frosting have a soft, flaky crust this is layered with homemade apple pie filling then drizzled with caramel frosting! I have a confession. I’m not a big fan of pie crust, it just doesn’t do it for me, but I LOVE apple pie! That’s why I love these delicious Apple Bars. The crust is way better than pie crust in my opinion, the filling is just like apple pie filling and it’s got this amazing Caramel frosting drizzled on top! It’s like the best of both worlds! I was having my annual Fall/Winter Scentsy open house this week and I of course needed to make some treats for this. I feel a bit of pressure when people come over to provide great food due to this blog. One of the hazards associated with this. Then I feel the need to bake and create which usually ends up in way to much food. My hips do not like this as much as my tummy does like this. Then I bring it work and try to feed my fellow employees. They like this much better than my hips do! 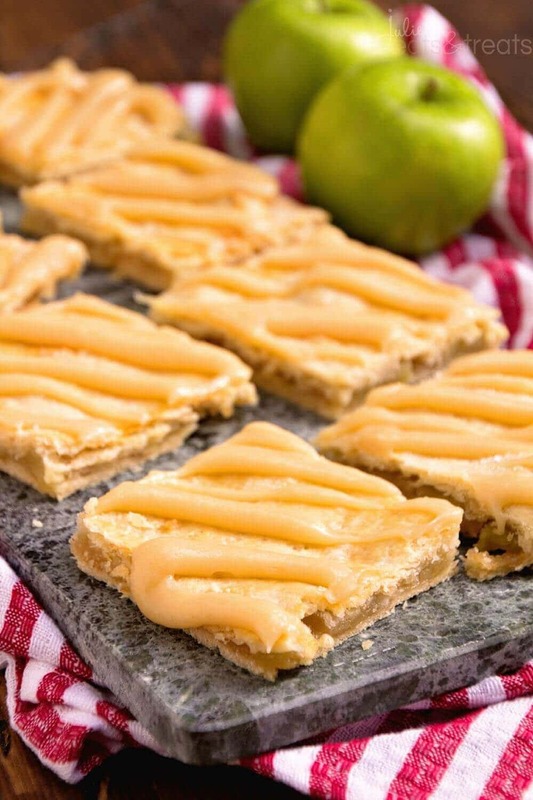 I scoured Pinterest for an apple bar recipe to make for this event and I found great ones, but none I fell in love with. I think went the old fashioned way and grabbed a church cookbook out of my cupboard. That’s when I found this recipe and decided to go with it. I’m not a big crust maker but this one is forgiving just smash it into the pan and it will be fine! The original recipe called for a powdered sugar icing but I mixed things up and want for a caramel cream cheese frosting. I mean caramel and apples go together like salt and pepper right? They do in my book! Mix flour, salt, a tablespoon of sugar and melted butter together. Separate the egg. Put yolk (reserve egg white) in 1 c. measuring cup. Add milk to 2/3 line. Mix together with the flour mixture for the dough. Take half of dough and roll out to fit a 10×15 inch jelly roll pan. Put dough in the bottom of the jelly roll pan. Sprinkle crushed cereal over the dough. Top with apple mixture. Roll out remainder of dough. Place on top of apple filling. Beat the egg white and brush over the top. Sprinkle a little sugar over the top and bake for 45 minutes. While the bars are cooling combine the cream cheese and butter in a microwave safe bowl. Microwave until you can whisk the mixture together. Whisk in caramel sauce, milk and vanilla until smooth. Whisk in the powdered sugar until smooth. Drizzle over bars. What do you think, are you ready to give these a try? They are a delicious dessert and an indulgent snack. We 💖💖💖 them and I’m sure you will too! Whether you’re taking them to a potluck or an easy dessert they are a great sweet treat!!! I have a few more Apple Bars on the blog you’ll love! The perfect fall dessert! 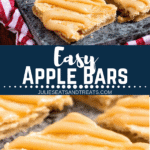 These Apple Bars topped with a Caramel Frosting have a soft, flaky crust this is layered with homemade apple pie filling then drizzled with caramel frosting! Mix apples and 1 c. sugar together and set aside. Mix flour, salt, 1 Tbsp sugar and melted butter. Put egg yolk (set the egg white aside for later) in 1 c. measuring cup. Add milk to 2/3 line. Mix all these ingredients. Take half of dough and roll out to fit a 10x15 inch jelly roll pan. Put dough in the bottom of the jelly roll pan. Sprinkle crushed cereal over the dough. Top with apple mixture. Roll out remainder of dough. Place on top of apple filling. Beat the egg white and brush over the top. Sprinkle a little sugar over the top. Bake at 350 degrees for 45 minutes. While bars are cooling combine the cream cheese and butter in a microwave safe bowl. Microwave in 15-20 second intervals until you can whisk the mixture together. Whisk in caramel sauce, milk and vanilla until smooth. Whisk in the powdered sugar until smooth. Drizzle over bars. I love baking with apples. LOVE it and I love these bars. They look so good and I’m sure your house smells divine! Oh my! Baking with apple is the best! Love these bars. OMG these are the ultimate fall treat, I cant wait to go apple picking next week and make so of these bars! What size jelly roll pan did you use? I used a 10×15 inch pan! Yay for apples! These bars look amazing! Love the caramel frosting! These bars look super good! It’s funny I feel the same way about the need to pump out super amazing food to guests because of having a blog. Yay for apple season! These bars look incredible! Just made the bars and am ready to frost them! Should they be refrigerated due to the cream cheese? I’m not serving them for 24 hours. I usually refrigerate them! Take them out about 1-2 hours before serving but they are great cold too in my opinion! Such a delicious looking apple treat! It’s so delicious I can’t stop eating them! Any apple dessert is perfect for fall! 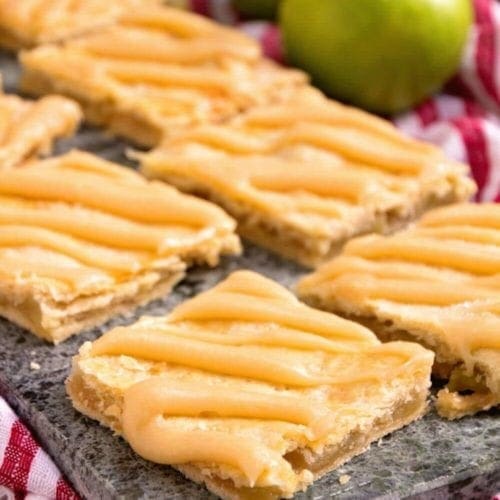 These apple bars with caramel filling look so addicting and dangerous!!! I agree! Apple all fall long!